A Life of Sugar and Spice: Just do it. Like Nike. Last night I got in an awesome workout at the gym, half hour of cardio on this new Precor machine that is a cross between an elliptical, a stair climber, and a trampoline... yeah I know, weird right? But fun. And killer on the legs. Then I did a solid strength training circuit. I feel great and I must have been retaining a ton of water because I've lost 5 pounds since Monday. I felt like a sausage in my clothes yesterday and today I feel normal again. It's really great. I signed up on the Clean Eating forums and it is a huge help. There are tons of threads about recipes, tips, support, answers to just about any question you have.. but it's a pretty simple thing. Eat as close to nature as possible. Exercise. Drink lots of water. Today has been another successful day so far. I'm running low on groceries but I've been doing great with making healthy choices if I have to go grab something. I've been eating a lot more fruit and veggies which is great, I'm sure that was a big help with flushing out that water retention. Finally my nectarines are ripe!!! This was sooooooo delicious and juicy, hold the napkin under your chin kind of juicy. I always think back to when I was little and my mom would buy these for me and my Dad and I'd eat them out in the yard, juice all over my hand and dripping down my arm. 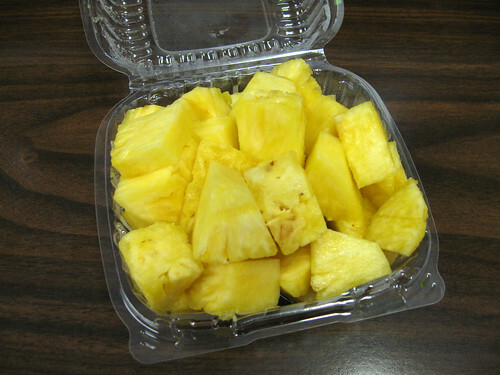 And I also picked up this tub on pineapple this morning on my way to work. So good! Tonight I'll do some form of cardio and then maybe some yoga. I could really use some deep stretching after the tough workout from last night. I'm considering registering a domain for this blog. Sugar and spice.com is already taken, your sugar and spice is not, which is the address for the blog now but I'm thinking about changing it. Any ideas? Thats awesome =D. I'm glad you're figuring out the best balance for your body! 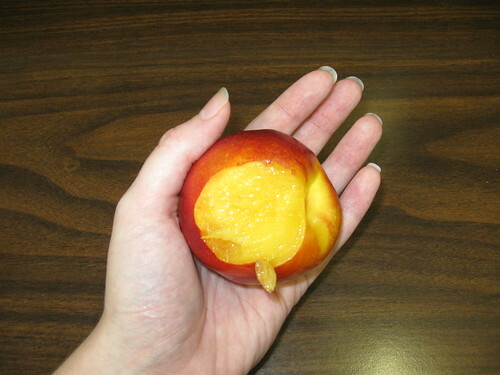 The nectarine looks absolutely delicious as well. For a url you could do my sugar and spice, for something a little different. Your Sugar and Spice would work well! Very cool.